Queen Elizabeth the Queen Mother had strong Scottish connections. Before her marriage, she was Lady Elizabeth Bowes Lyon, daughter of the Earl of Strathmore and Kinghorne, and spent much of her childhood at Glamis Castle in Angus. 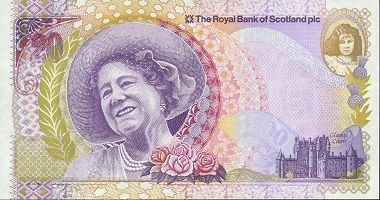 So it was only natural that the Royal Bank of Scotland should issue a bank note to commemorate her achievement of reaching her 100th birthday on 4 August 2000. As in most of the Royal Bank commemorative notes, the design on the front is not greatly different from the normal notes. The portrait of Lord Ilay, the first governor of the Royal Bank of Scotland (in 1727) is prominent and the "stars" in the ornate ceiling of the bank's Head Office in St Andrew Square are a feature near the top of the note. In the case of the Queen Mother Commemorative notes, however, it was decided to use the higher value of £20 instead of the £1 or £5 used on other occasions and the notes also bear a gold crown. . All the serial numbers begin with "QETQM" and run from 00000001 to 2000000 for the two million notes issued and for the first time the signature of the new Group Chief Executive, Fred Goodwin appear on a Royal Bank note. 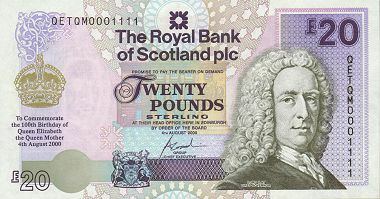 Uniquely in Scottish banking, he had previously signed Clydesdale Bank notes when he was Chief Executive there. The reverse of the commemorative note shows a hand engraved portrait of Queen Elizabeth the Queen Mother and the overall design is "art nouveau" reflecting the style in vogue in 1900. There are a number of images associated with royalty and Scotland - the laurel to the left of the portrait, gold inks, a thistle and other floral images associated with Queen Elizabeth the Queen Mother, and there are hints of tartan in some of the patterns. On the top right of the note is a cameo portrait of Lady Elizabeth Bowes Lyon at the age of six. Under this is an engraving of Glamis Castle, her childhood home.